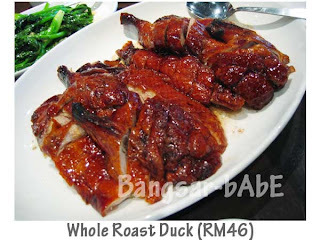 After reading this post, I’ve been wanting to try the roast duck at Four Seasons. I went there last Sunday only to find the place CLOSED. o_0 This afternoon (Saturday), I decided to try my luck again but not before making a phone call to check whether they are open. So rif and I headed to Capsquare KL with his parents…hoping to reminisce the oh-so-delicious duck I had in Four Seasons, London. 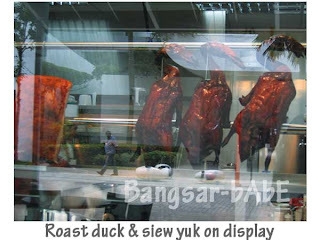 As I was walking towards the restaurant, I saw big, juicy-looking ducks (and a not-so-nice looking roasted pork) hanging at the display of the restaurant. The restaurant was rather quiet on a Saturday. I’m guessing they get volume from the working crowd. I told the manager we wanted one whole duck and a vegetable dish. He thought I was joking and confirmed with me again. WTH?? o_0 I told him yes…ONE WHOLE DUCK please. rif and I always eat one whole duck ourselves in London…that means half a duck each plus rice. AGAIN…the manager said, “I personally think it’s too much duck for the four of you. Half would be just nice”. rif and I gave him THE LOOK. (say half a duck one more time and we’ll wring your neck). I asked if they debone the duck before serving and yes…they do it just like the original outlet. BUT, we were told that a deboned duck will have less meat than the duck with bones intact. rif’s mum said get the boned one better…ok lor…listen to her. 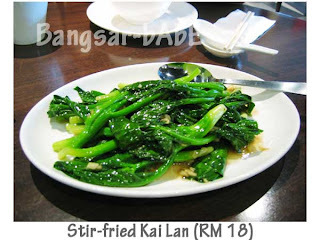 Our stir-fried kai lan came first. Lightly seasoned and fried with fragrant garlic and ginger slices, it tasted great with fluffy white rice. The glorious duck came soon after…with a jar of their special chili oil and pickled green chilies. The duck was incredibly juicy and tender. The skin, while not as crispy as the original was sinful with a thin layer of fat underneath. Sheer bliss. I found it difficult to eat the drumstick and bony parts. rif agrees with me. We’ll stick to the deboned version from now on…too pampered already. 😛 Service was quite good. The waiters were quite attentive and quick to change our plates whenever they got slightly dirty. I think the duck is quite reasonable. In fact, it’s cheaper than Sunrise and Loong Fong…yet soooooo much better. Do note that their drinks are quite pricey. 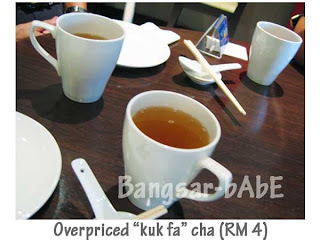 One cup of “kuk fa” cha cost RM4. Verdict: As long as they keep up the good standard, I don’t have to keep hankering for Four Seasons Bayswater anymore. yes the duck was rather heartly fed. 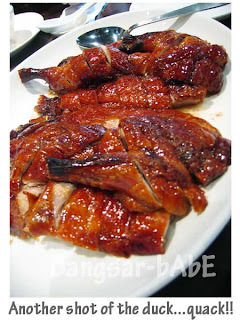 not like those so called “meatless crispy” duck, but was rather meaty, tender, and crispy duck. i can see myself visiting that place some time again this month. 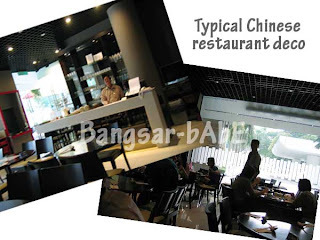 This time I want to try the wantan mee…looks interesting. i ask them if they debone..they say err they chop only wor..how come urs can de-bone??? Ya…my duck was meaty that day! How come yours was aneroxic one?? Leng lui get better deals than a ma latt loh? LOL. the last time i had it was when i was in london 6 months ago… ghmmmmm…. simon – I think maybe the manager over-promised me…have to go back there again to see whether they de-bone the duck. 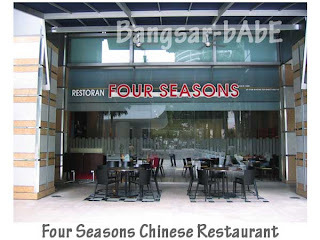 zewt – The last time I had Four Seasons Bayswater was last October.